I saw this on a friend's blog and thought I would post it on mine. I'll try to get Ryan to do it too but we'll see how that goes! 1. What was my greatest accomplishment? 2. What do I regret the most? 3. What was I most thankful for? 4. What will I change for next year? 5. When did I feel the most loved? 6. What was the most exciting thing that happened? Sadly I don't think I can say anything "exciting" happened to me this year, I'm still waiting . . .
7. What am I most looking forward to? Its set, we're going at the end of June for our friends' wedding and our first vacation since our honeymoon! By that time we'll have been married for almost 6 years so we're long overdue. Here's a more interesting post for any guys that might look at our blog! Ryan went on a ride with the LA weekend riders, a group of guys he met online through a website. They get together and go on dual sport rides, which is a bike that can do street and dirt. Ryan's bike is a 2001 Suzuki DRZ 400 (did I get it right?) and looks just like a dirt bike. The trails that they took were up in the mountains and some of them were covered in snow and ice! Being that we were in Idaho for several years Ryan handled it pretty well but snow is foreign to people in SoCal so not all of the guys felt the same about riding in it. Hensel Phelps Christmas Party at the Hilton Bayfront in San Diego, built by Hensel Phelps but not a project that Ryan was on. We got all dressed up, ate a fancy dinner, and gambled without spending any money! We spend the time with our friends Dave and Natalie, and I think we were the only people there not taking advantage of all the free alcohol, but we still had a blast! My favorite new place is San Diego and I hope and pray that Ryan's next project will take us there! We spent the weekend there because Ryan's company, Hensel Phelps, had their company Christmas party at the new San Diego Bayfront Hilton built by Hensel Phelps and it just opened a week ago, right on time for our party! Its a very swanky, modern place and I promise I'll post pics once I find the cord to connect the camera to the computer. We still are in somewhat of a mess from moving, and most likely we'll just have to do it all over again in about 6 months. The party was a blast, so fun to get dressed up and go to a grown up event. Then we spent some time just driving around and seeing some local attractions. Its such a great place, I really didn't want to come home. Okay, pics are coming in the next couple of days! I decided to try to get with it and change our blog background, but now I lost all my widgets with my friends list, counter and music player. Ooops!!!!!! I love Black Friday and have frequented many stores over the years in search of fun, cheap stuff. This year we just didn't want to get up!!! Plus it was our first time in California for Thanksgiving in 6 years and we weren't sure how manageable it was going to be. Black Friday is pretty low key in Idaho, still lots of people and lines, but not madness. Well we just bought one thing and I'm so excited, an all in one super nice printer/scanner/copier! I've been wanting to get started with a new hobby lately, and now I have one. There are boxes of pictures that Ryan and I both have, and I'm looking forward to saving them all digitally and then I can start digital scrapbooking from old pics and new ones. I also acquired Photoshop Elements a few months ago and now I can use it to enhance old pics, remove red eye, rotate, crop and tons of other stuff that I'll learn how to do eventually. So here is the first pic that we scanned, just to give it a test run. I could stay up all night doing this, and I totally would if I didn't have to work (bleh!). 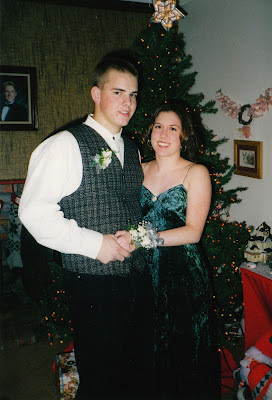 In this picture Ryan and I were going to Winter Ball in 1997, our junior year in high school. We had already been "going out" for a little over a year at this point. I can't get over how different we look, especially Ryan! I'm sick with strep throat so I stayed home from work today. I'm feeling 60% better and am planning on going back tomorrow. So with all this time I have, I should be updating our blog. I mean, I have to go back to August when we went to the X Games, then lots of other things from then until now. But, I just don't feel like it. Our pics aren't organized well and on a Mac it's tricky to load pics, easy, but it still takes me some time because I'm not that good at it. So until I feel really motivated, you're just not going to get an update. I guess it's cuz I feel like we don't have as exciting stuff going on right now. 1. I want to learn how to play the drums. For now I have Rock Band but eventually I would love to do the real thing. 2. Sometimes I just want to get rid of everything and travel the world indefinitely. 3. I quit drinking soda about 4 months ago. But even when I did drink it occasionally, I have always hated root beer. 4. I've never played organized sports. 5. The first concert I went to was Green Day when I was 14, and my parents took me! 7. I love ethnic food. 8. Right now I would give anything to be a mom. 2: People who are tagged need to write a post on their blog about their eight things and post these rules. 3: At the end of the post you need to choose 8 people to get tagged and list their names. I'm leaving for Fremont tomorrow morning to spend the weekend with my best friend Kim, and we're going to a New Kids on the Block concert!!! I'm so excited as I was a big fan as a kid, as big of a fan as you can be when you're 10 years old. My mom never took me to see them because she said "You're too young!" Come on mom, it's because you didn't want to be in an auditorium with screaming pre-teen girls and annoying pop boy band music, admit it! Well now I get to go and I'm stoked! You can think I'm a dork but I really don't care because it's going to be awesome! I finally got my California license (again) and the best part is, since I used to have one, it was just a renewal so I only had to take half of the test. And, I still have my original license number, which I memorized about 11 years ago! I actually wasn't sad to let go of my Idaho license. I still miss living there and would go back, but there's nothing for us there. But, I wouldn't mind being in cooler weather right now. It's still in the 90's here and it's almost October!!! Okay, so I'm feeling better about everything. I'm on medication that has a tendency to make me extremely emotional/hormonal and I think that factored in with the fact that Ryan was gone for a few days and I had a few bad days at work just created a meltdown! I had to just realize how temporary our current state is. Ryan is going to get transferred to a different project anytime between March and July of next year, and that's coming up soon, especially when I think about the fact that we've already been here for 4 months and sometimes it only feels like a few weeks! And hopefully very soon we'll be adding to our family, but nothing yet. So please keep us in mind and do whatever you do, cross your fingers, pray, dance a jig, etc. to bring us good luck to make that happen! I finally pinpointed the reason for my feelings of melancholy lately. I just haven't been my total self since we've moved, I still feel overwhelmed from moving and not being 100% settled yet, I jumped into a job before I was ready to start working again and there is something else constantly looming over my head that I can't get to go away. I feel like Tantalus from the Greek myths, where what I want is right at my fingertips but when I go to reach for it I can't have it. Anyways, I realized that for the first time I have nothing to look forward to and I don't know what to do with myself. For the last, hhmmm, probably 10 year or so, there's been the prospect of change and something new happening in life, and now that's over. First there was graduating from high school and going to college, then Ryan and I getting married, then finishing college and starting my career, Ryan finishing college and getting a job, us moving and now that the move has happened and we're here there's nothing else happening that I can look forward to. How depressing. Yes, things will happen, but not anytime soon that I know of. Ryan will change projects next summer, but since we don't know where they'll send him it's not anything to look forward to, especially if we have to move again. Ugh. Then there's the prospect of Guam but it could be 2 years before that happens, and at least a year to a year and a half until we actually find out about it. So it's completely ridiculous to look forward to that when I don't know anything about it. And who knows when, if ever, we'll have kids and I can't look forward to that because I'll just be constantly disappointed, plus that would be ridiculous to look forward to something that isn't happening in the first place. Something better come up soon, or else I'm going to go crazy, sell all of our possessions and plan a trip around the world for a year just so I have something to look forward to and be excited about for the future. I shouldn't have just given myself that idea . 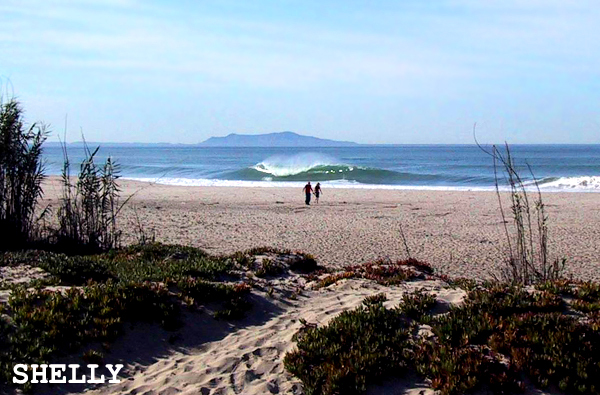 . .
Last weekend we went beach camping at McGrath state beach in Oxnard. It's north of Malibu and is pretty much south Ventura. It was cold! I could never go back to Idaho now, I was actually cold, cold, cold in 70 degree weather. It's still in the 90's here so I'm getting quite used to it. I still feel hot, but anything less than 75 or 80 feels cold to me now. Anyway, it was fun to get away and camp. We didn't do any swimming or sunbathing because it was totally overcast and windy but it was still so fun to get out and do something. I also saw my cousin Rachel, who happened to be in Santa Barbara that weekend on a break from her studying abroad that she's doing in Costa Rica! Good to see you Rach even though it was short! Other than that we're just working and that's keeping us plenty busy. Ryan's in Irvine right now for training for a few days. We still don't know anything about Guam (but I hope we find out soon!!!!) and nothing else is new. So, this summer was it for fun blog entries for us. Oh, I am going to New Kids on the Block so that will bring some excitement in about a month! About 2 weeks ago Ryan had an accident with his motorcycle. He is totally okay and did not get in it with anyone else, just himself and the nasty, oily, filthy road in Los Angeles. He was getting off the freeway and making a right hand turn. The gutter was overflowing with garbage and he said the road was slick with oil and he slid out and fell over. He scraped his knees pretty bad, tore his jacket on the sleeve, and scraped his bike in various places on the right side. Other than that he was totally fine, just extremely pissed off at how disgusting L.A. is that the gutters are overflowing with garbage and oil so much that it pollutes the streets. I'm very grateful that no one else was involved and that he didn't get hurt. So if you happen to hear anything, that's what happened. Too busy or too lazy? So I have a few things to update, but the daily grind of work has gotten to me and I'm barely on the computer anymore. I finished Breaking Dawn and loved it! It's still really hot here and we're still not totally unpacked. We went to the X Games a few weekend ago and it was a blast! We also went to a Dodgers game (thank you Hensel Phelps!) and have pics from that too. But other than that we've just been working. I think all the exciting, new stuff is over for now and we're back to our boring old selves! I can't put it down. I don't want to put it down. But I have to. If it wasn't for the daily obligations of life like work, eating, sleeping, etc, I'd already be done! Yes, we felt it. No, this is not the first time we've felt an earthquake. Ryan and I grew up in the Bay Area and they happened frequently. We were kids when the big quake in 1989 happened that canceled the World Series and several sections of the Bay Bridge collapsed. But, I haven't felt one in a while so it was kind of weird. I think the whole time I lived in Idaho I felt 2, and they were pretty small. I hope this one doesn't mean theres more to come. I'm a kindergarten teacher! After much pondering I decided to take a job I was just offered last week to teach kindergarten at a small, private, nondenominational school. I get to teach the curriculum that I taught in first grade, and use all of my supplies that I spent tons of money on last year (Ryan's happy about that) and I have my whole class to myself and it's all up to me! It's going to be a lot of work because school starts on August 18th (aaaaaahhhhhhhh!) but I know I can do it. Ryan is very supportive and so happy that I was able to find a job, as am I but I'm also overwhelmed with everything that has to be done to get the school year started. I'm very grateful to have found a job because the teaching market is very competitive right now as there are NO JOBS and I've been searching since March. There were over 50 applicants and they chose me, wooohooo! It's close to home, the pay isn't fabulous but there isn't a lot of money to be made in teaching anyways. I'm grateful to be able to teach again, especially a grade I feel comfortable with, and I'm very thankful that I was able to find a job so quickly (I interviewed twice last week and they let me know Thursday) and so close to home! From now on every second is going to be spent getting ready for school. I formally start next Monday, but I already got started today. Hopefully I'll have my class set up this week so that next week I can plan the first couple of weeks of school in the next 2 weeks! First off, a scenic motorcycle ride through the canyons. It was a blast, as it always is joyriding on the bike, but it was blazing hot! Here we are with our chubby helmet faces. We stopped for a picnic lunch at a "lake" (more like a pond) off one of the canyon roads. We thought we might be able to go swimming, but once we saw the water up close we changed our minds! It was nice to be in the shade of the huge willow trees. Some areas of the ride were more scenic than others. This one canyon was lush and green, where others were brown and dry. We passed by Castaic Reservoir and both wanted to jump in! The chocolate fondue was scrumptious! All of the treats to dip in it were yummy, but the cheesecake was my favorite. I think I can say it was the best dessert I'd ever had, and especially the best chocolate too (besides a swiss chocolate bar!). We couldn't stop eating it, even after all the little yummies to dip in it were gone! Last weekend Ryan's aunt, uncle and cousin came to Irvine for his cousin Kayla's competitive softball tournaments . We met up with them on Friday after Ryan got off work at Pink's hot dogs because they really wanted to try it out. There wasn't even a line, crazy! After that we went to Rodeo Drive because his aunt has always wanted to see it. All the stores were closed but it was fun to see them all lit up with their ultra fancy merchandise on the inside. Almost all the stores say on the door front "By invitation only" or "By appointment only". Well I didn't want to shop at your ridiculously overprices stores anyways! Here we are on Via Rodeo, an addition to Rodeo Drive. I love how it looks like Europe! I was amused by this! I once lived in Moscow for a few months so I love all that is Russian! Okay, this is really gross. We all know the fair is the place for the most disgusting, fried, greasy, fattening food on the planet. This one food shack had some gross fried food like fried oreos, fried frog legs (yep), fried twinkies, fried sweet potatoes, and a myriad of other things like fried chicken, french fries, etc. So then I look closer and saw this sign. A friend chicken sandwich with a donut for a bun served with honey and raspberry sauce. I'm sorry, but no wonder so many Americans are unhealthy and overweight. This is absolutely disgusting! That night they had a freestyle motocross show with about 7 sponsored/semi-pro riders doing tricks off the ramp. It was fun and Ryan was especially happy that we got the chance to go! These guys are so fearless, half of them did back flips like it was a natural thing because now the trick to go for is the double back flip, they're nuts! The video on the top shows the mx riders and their insane tricks! The one of the bottom shows what we encountered on the way home that night.